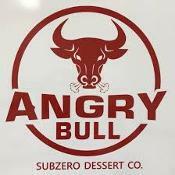 Sun 12:00pm - 6:00 pmAngry Bull is a novelty dessert shop offering fruity cereal puffs soaked in liquid nitrogen. This Instagram-friendly snack goes by many names including nitro puffs, nitro pop or liquid nitrogen snowballs. These hyper-frozen snacks taste similar to Fruit Loops or Trix and will be offered any seasonal flavors as well. When eaten and exhaled, this seemingly smoking dessert releases as a thick fog mimicking an angry bull's breath releasing smoke from the nostrils!